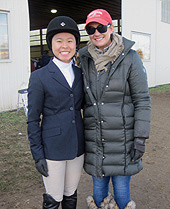 Campus Equestrian has never presented more than ten photos on a region page at one time until now, for there are eleven photos posted here starting with Sara Soba of Dickinson College (on left, with head coach Lindsay Vulich). Going back to last season the sophomore from Atlanta, Georgia won all six of her walk-trot classes and will compete at 2019 Regionals in the division. Regionals will be held at Briarwood Farm at Black River Farm in Ringoes, New Jersey on Sunday, March 24th. 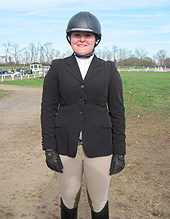 From Rochester, New York, Samantha Hurley is one of at least five Penn State University hunter seat riders from their main campus (sometimes known as State College or University Park) to have qualified for Regionals through November 10th. Hurley pointed out of intermediate flat and now rides in both open divisions. Incidentally Hurley is one of at least four Nittany Lion riders named "Samantha" on the 2018-19 roster. 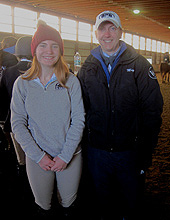 Bucknell University co-hosted the final fall hunter seat show with Susquehanna University and Emily Van Beek (pictured) was one of many members of the Bison involved with the operation of the show. From Hunt Valley, Maryland, Van Beek is qualified for Regionals in the novice flat division. Most recently Van Beek won at her new level, taking the blue ribbon in intermediate flat on November 11th. 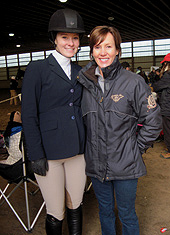 Last season Danielle Huver of Susquehanna University (on left, with head coach Jan Phillips) qualified for Regionals in both hunter seat novice divisions. Huver will be back at Regionals as she has pointed out of intermediate flat. While Susquehanna and Bucknell were co-hosting hunter seat several Region 1 schools had western riders showing further north in Lafayette, New Jersey. 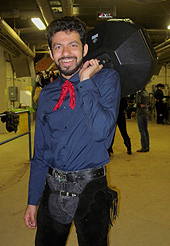 Campus Equestrian is not sure if Ali Al-Attar of Penn State (pictured) was entered in the double western shows on November 11th. From Kuwait, Al-Attar was third inp individual beginner western horsemanship at the March 2018 Semifinal event in Reedsville, West Virginia, which qualified him for Nationals in the division. Across multiple regions there are several Penn State campuses with IHSA teams. PSU-Harrisburg, PSU-Berks, PSU-the Behrend Campus, PSU-Altoona and of course the main campus are the ones with active IHSA teams. 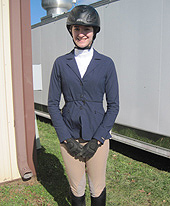 The Altoona campus rides in Region 1 with the main campus, and Chloe Otto of Altoona (pictured) is the first rider from her school to qualify for Regionals this season. 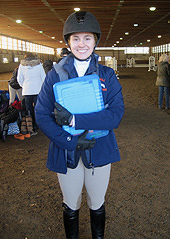 A sophomore from Fairfax Station, Virginia Otto is qualified in the advanced walk-trot-canter division. 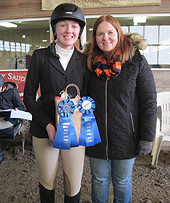 Seen here with her Mother at the November 12, 2017 Susquehanna show (when she won both of her novice classes) Keelyn Weber of Gettysburg College (on left) is qualified for 2019 Regionals in both hunter seat novice divisions. Though Penn State is undefeated through five shows they are not untied, as the Bullets tied the Nittany Lions for high point team at the October 20th show Gettysburg co-hosted with Wilson College. What's this? A Zone 2, Region 1 coach on the Zone 3, Region 1 page? 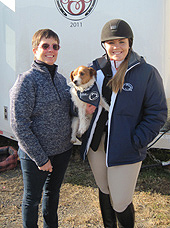 While Stacy Jonas (on left) is in fact the head coach of the Ithaca College equestrian team her daughter Jaclyn Calale (on right, holding "Peter James") graduated from Penn State last May. But before she graduated Calale was second in individual intermediate over fences at Zone 3 Zones last April 7th. On May 3rd Calale received a combined judge's score of "83.5" in the same division at IHSA Nationals. At that time that would have been fourth place, but the top five were tested at Calale moved up to Reserve Champion at '18 Nationals at the Pennsylvania Farm Show Complex in Harrisburg. Through the first four shows Wilson College was still looking for their first Regional Qualifier of 2018-19. On Novembe 11th Elizabeth Theriault (on left, with head coach Megan Mendenhall) became that qualifier. From Bristol, Connecticut Theriault picked up two points to point out of the novice flat division. Head coach Mendenhall is one of three Wilson graduates competing in the alumni divisions this season. Former Phoenix riders Morgan Thomas and Molly Jean McElroy took part on November 11th, with Mendenhall's first in alumni fences the best ribbon of the day for any of the Wilson alums. When older sister Katherine Acocella rode for Dickinson earlier this decade we took a photo of Katherine with her Sister and her Mother at the previous Briarwood Farm location. Fast-forward to the fall of 2018 and younger sister Kristen Acocella (on left) has followed in her footsteps and rides for Dickinson as well. Kristen is qualified for 2019 Regionals in both hunter seat intermediate divisions. 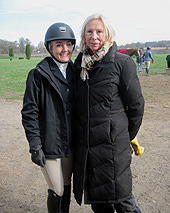 We must mention once again that their mother Jane (on right) was Jane Bilafer when she rode for Marymount College in the early 1980's and reached Nationals at least once (1984 in Harrisburg, riding in the same coliseum as was used for 2018 Nationals). Dickinson scored their all-time high team total on November 10th with 43 points but were still narrowly beaten by Penn State with 45. 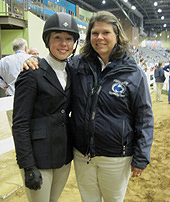 We are not sure who leads the Region 1 hunter seat open rider standings at the moment, but even by giving the rest of the region a head start Elizabeth Traband of Penn State (on left, with head coach Kristen Gretok) may have the honor. Seen here two seasons ago at 2017 IHSA Nationals in Lexington, Kentucky Traband missed the first two shows of the season. However the fourth place-finisher in the 2018 IHSA Nationals Cacchione Cup Competition has earned five firsts and a second in the three shows held since. Traband was high point rider at both shows held at Briarwood over the November 10th/11th weekend during which she was undefeated. Several open riders either missed a show or started the season in only one open division creating what could still be a close race for the top spot. Schools competing in Zone 3, Region 1 during the 2018-2019 school year: Bucknell University, Dickinson College, Gettysburg College, Lycoming College, Penn State University (State College), Penn State University at Altoona, Susquehanna University and Wilson College. Schools in each Zone 3 Hunter Seat Region will show western as part of one big region in 2018-19. Towson University from Zone 4, Region 1 will also show western within Zone 3. Show Schedule subject to change.